The HELOS-G Case Kit is a top shelf vaporizer pen designed for waxy substances, essential oil, or alternative concentrates at home or on the go. This kit carries a premium eDab traveling case to keep everything tidy and organized and offers all you'll need to get lungs full of dense vapor on demand. 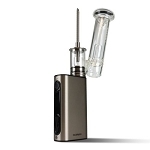 Beginning at the top, you have a thick borosilicate glass dome to gather and deliver your vapor. By getting rid of the requirement for another mouthpiece the HELOS G world reduces the components your vapor comes in touch with before being inhaled. Pressing on the button will immediately erupt vapor into the dome whole you watch it accumulate while it is cooling and diffusing the vapor for a fresh, smooth encounter. The replaceable heating coils feature a ceramic dish that is broad so that your waxy oils may be loaded readily and quickly. 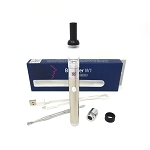 The kit comes with your selection of eFunnel or eNail coils. Either coil operates with anything meltable you can throw at it. The HELOS-G coils are interchangeable and may be swapped out with any cartridge from eDab's HELOS line. This kit contains 2 spare atomizer coils, for a total of 3 in the box to keep you vaping like a guru for the forseeable future. The HELOS G cartridge gets its electricity from the eDab "Spin", a slick 510 threaded battery with varying voltage output signal settings. Shifting the voltage is as simple as spinning the dial on the base of the battery and establishing the output signal from 3.2V - 4.8V; fully customizing the vapor output signal to your preference. Featuring all of what you would like and nothing you do not, the Spin has several safety features including overheat protection, and accidental discharge, overcharge to help keep a long life. The 650mAh battery that is rechargeable may instantly recharge in almost any conventional USB port and can get up to 6 hours of constant use. 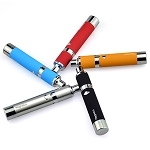 Pressing the button 5 times will lock the battery for safe journey, while pressing the button 5 more times will unlock the battery for use; a fantastic feature allowing you to keep or take your vaporizer pen in the traveling case without stress of it inadvertently turning on at the inappropriate time. In case you by chance forget to lock your battery, the heating element wills cease from staying on for more than ten seconds, which means you do not squander your stuff or damage your coil. Laser etching on the clean white LED button along the underside boasts the credibility and total quality of the superior eDab vapor pen battery, which means you know that you're vaping with the greatest. Everything fits neatly into the custom slimline eDab travel case when you are all done vaping. While being roomy enough to take your HELOS-G pen and all of it is accessories with you everywhere, this lightweight travel case was created to ease in your own pocket or bag. The black color and eDab symbol that is embossed on the lid add the an alluring touch. Relish waxy substance, your essential oils, and other concentrates with this particularly superior vaping option, the HELOS-G Case Kit, from eDab. 5 points worth $5 will be earned when you buy this item.